This is my version of a hobo/slouch bag. 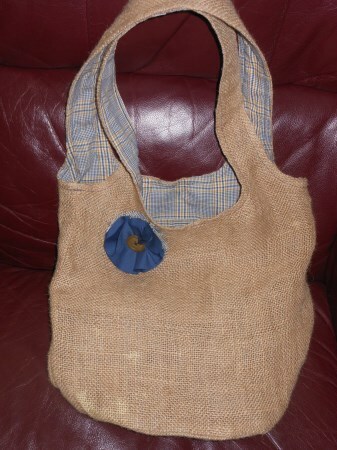 I used natural burlap and fully lined it with a poly/cotton blend of blue, tan and cream plaid. I added an inside pocket for keys, cell phone, etc. Each seam is sewn twice for durability. I made a detachable blue and plaid flower with a tan button center that can be moved wherever you prefer, and can also be worn as a pin. I also top-stitched around handles with navy blue. For a completely different look it can even be reversed, as shown in the last picture! Finished size is 12" high x 16" wide. This baby will hold a LOT of stuff! Please contact me with any questions before ordering. This item ships from United States. An additional charge of $4.00 will be added to each order for the current item.